The first time I made cassis and realized how simple it was to transform black currants into ambrosia (really, all you need is patience as it takes six months of maceration in a cool, dark place), I felt as though someone had been keeping a secret from me all these years–some of the most sublime food is ridiculously easy to make at home. As long as you have the ingredients and are willing to experiment a little with timing and consistency. 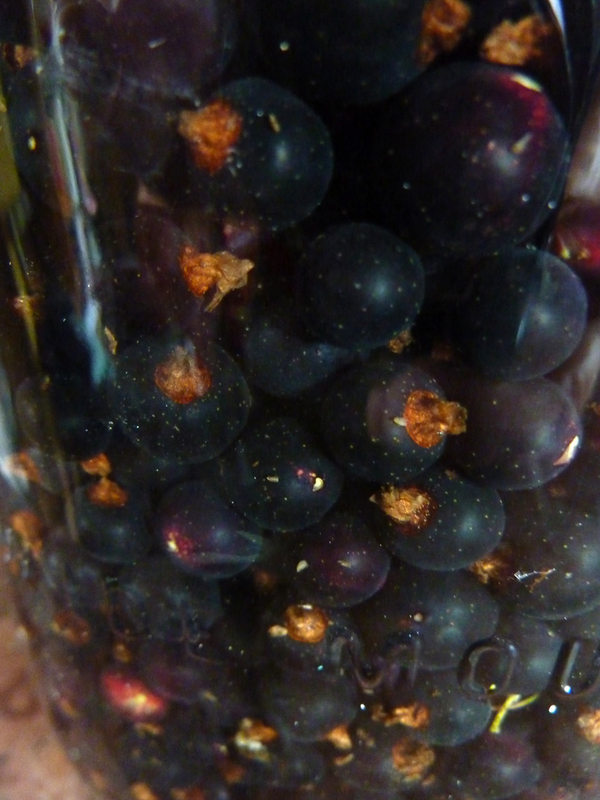 So, okay, most people don’t happen to have a few blackcurrant bushes growing in their garden. But getting your hands on good milk–raw or organic? Cow or goat? Not so difficult. Making simple, delicious fresh cheese is within our grasp, especially if we team up with friends to share the cost of a few ingredients and equipment–why we each need to own it all is beyond me. 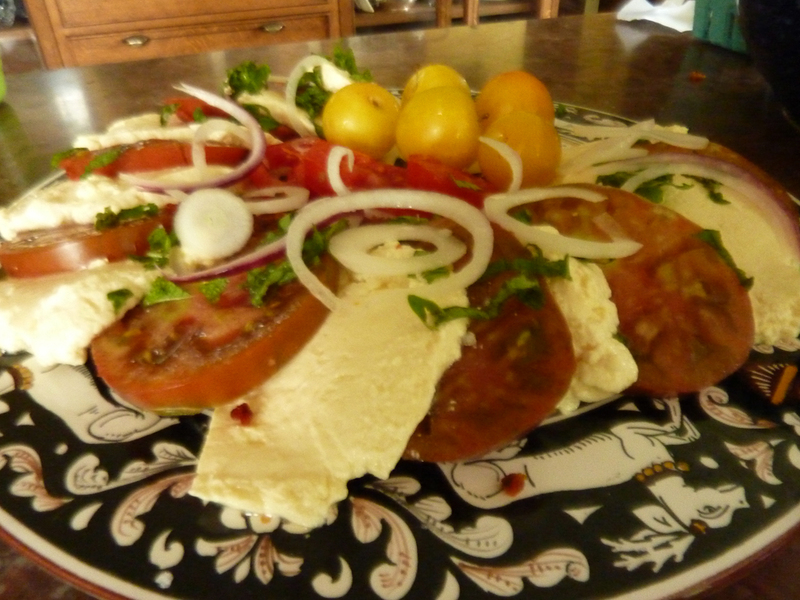 Fresh homemade mozzarella for lunch! This morning, Elizabeth, Emilio and I whipped up a batch of mozzarella in less than an hour, start to finish, and a wee bit of dreamy ricotta from the leftover whey even quicker than that (add time for it to drain). First time for any of us. I’d seen it made at a cheese-making demonstration class a couple of weekends ago, sent away for the rennet ($6.50 for a bottle that will last me the year) and citric acid ($6 for 8 oz–will also last a long time) though I later found both at our local natural foods cooperative, and we tried it out. New England Cheesemaking Supply Company also offers a great gift idea (sshh..I’m giving a bunch of these to family for birthdays and such)–cheese kits that include everything but the pot and the water and milk. As always, I had more than one recipe in front of me, this time the one from Lindsay Harris, cheese-making teacher/dairy farmer and the other from Ricki Carroll’s Home Cheese Making. I moved between the two to make today’s batch. Dissolve the citric acid crystals in a 1/2 cup of cool water (make sure you use non-chlorinated water). Heat the milk to 90 degrees (Over high heat is fine)–the stirring action is more a pushing around of the milk than an active stirring. You want to be gentle but thorough with the mixture. When it reaches 90 degrees, take it off the heat. 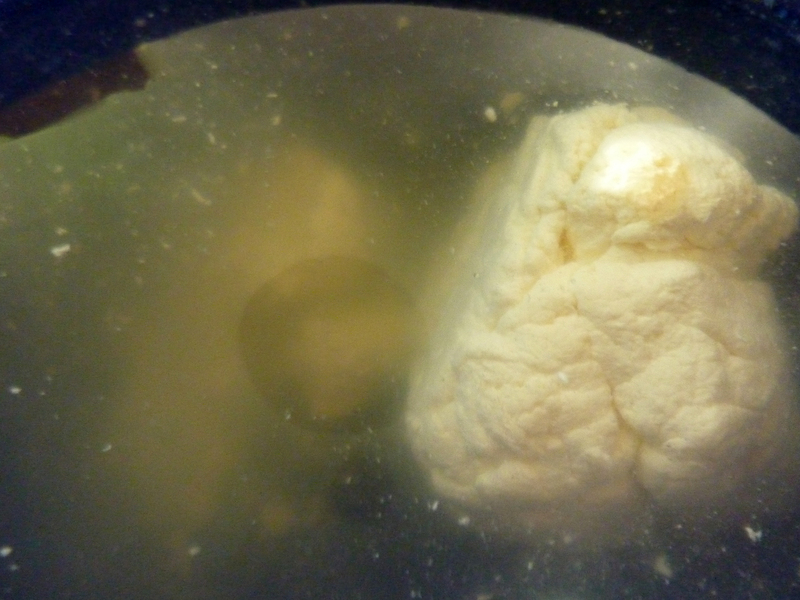 Dissolve the rennet in 1/2 cup cool water and stir into the mixture using the same techniwque as with the citric acid. 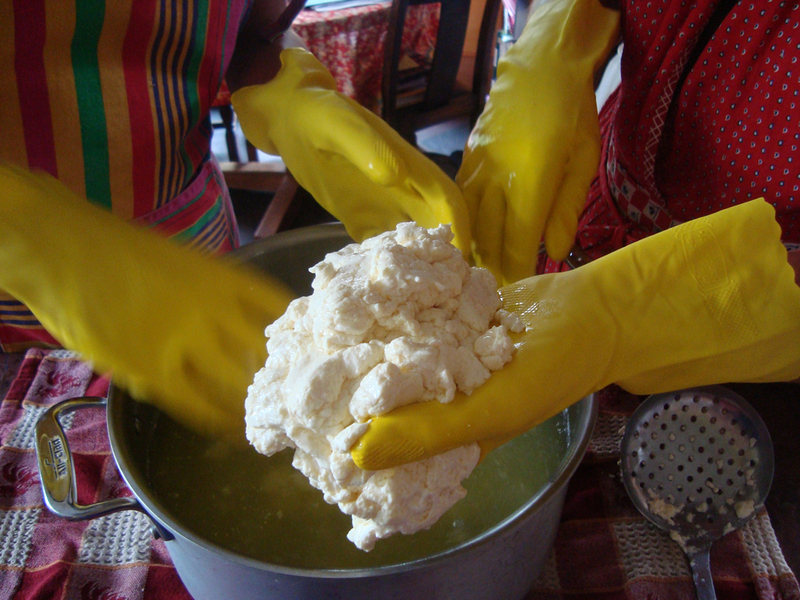 Leave the mixture alone for 10 minutes or when solid curds the consistency of silken tofu have formed. Do not stir. 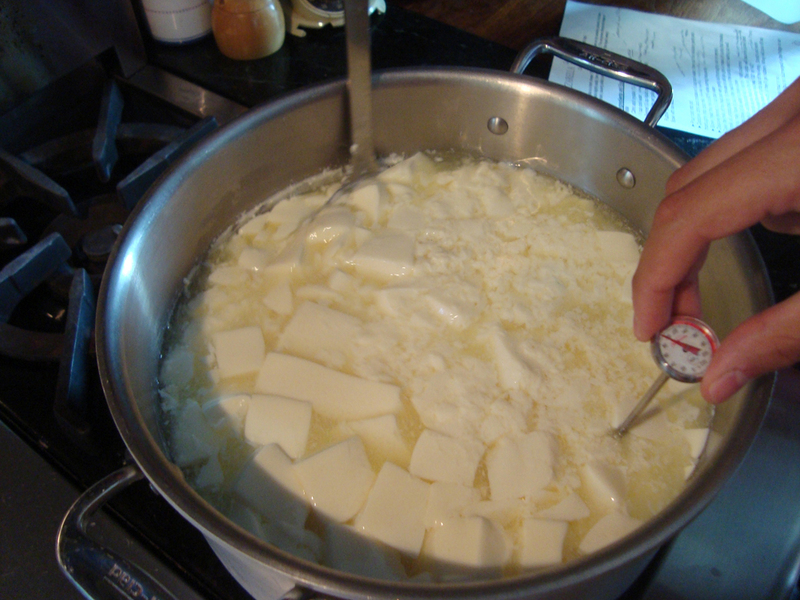 With a long knife cut the curds into a checkerboard by cutting one-inch columns vertically then horizontally. Place on the burner and heat, stirring gently, until the whey reaches 130-140 degrees (make sure the thermometer is measuring the when and not the curds.) This is where I erred too much on the side of doing less than more. Put on your rubber gloves, remove the pot from the heat, and gather the curds together in a single mass, pulling in any little bits floating about the pot. 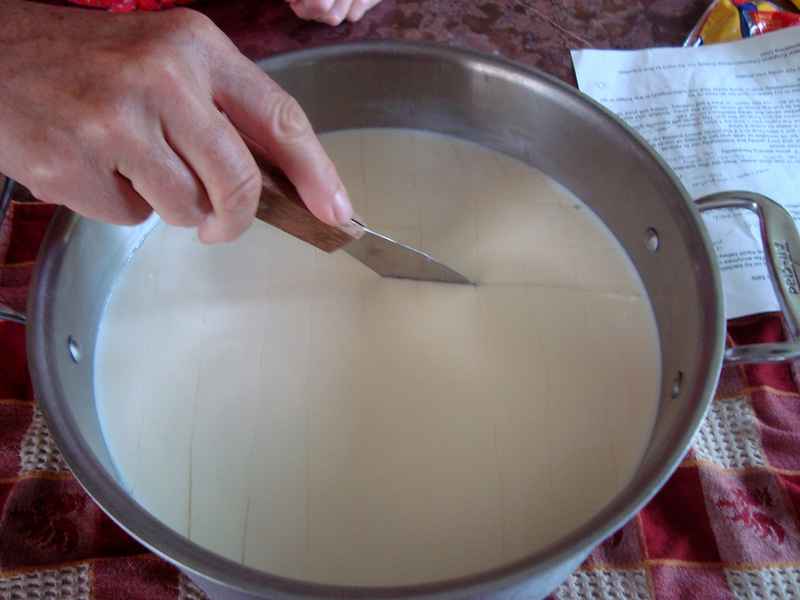 Stretch and fold the curds for about ten seconds–gently gently! Place in the ice salt-water bath to cool–for 10 minutes or an hour–it’s up to you how cool you want it to get before trying it! It makes a small, small amount. You can add whole milk to the whey if you wish to make more–I’m not quite sure how much more; I’ll try it out next time. Heat the whey to 195˙ stirring all the while. 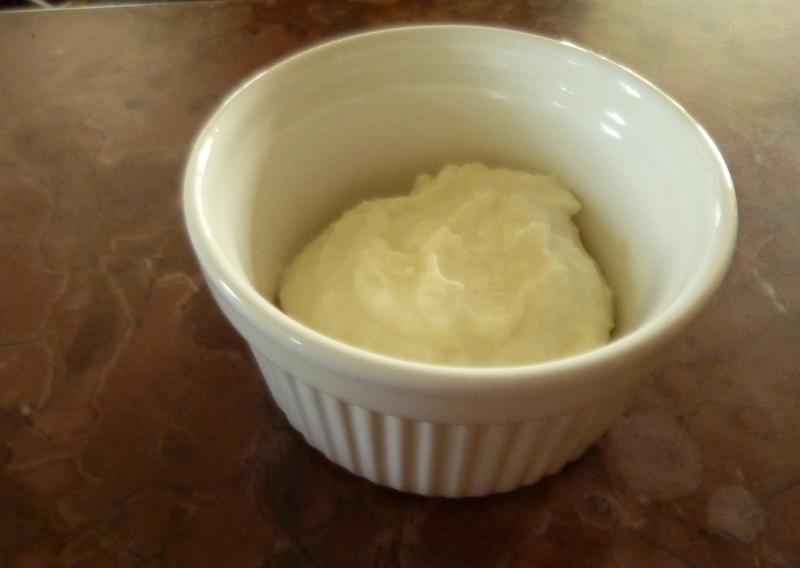 Foam and small leftover curds might form–skim them off. Lacey curds will begin to form in the final stages of the process. Remove from the stove and let it sit for 15 minutes to several hours. I let mine stand for about an hour. Line butter muslin (not regular cheesecloth) in a colander (I sent away for it from cheesemaking.com) and pour the mixture through–an alarming amount will go right on through and you’ll be left with a small mass of curds. 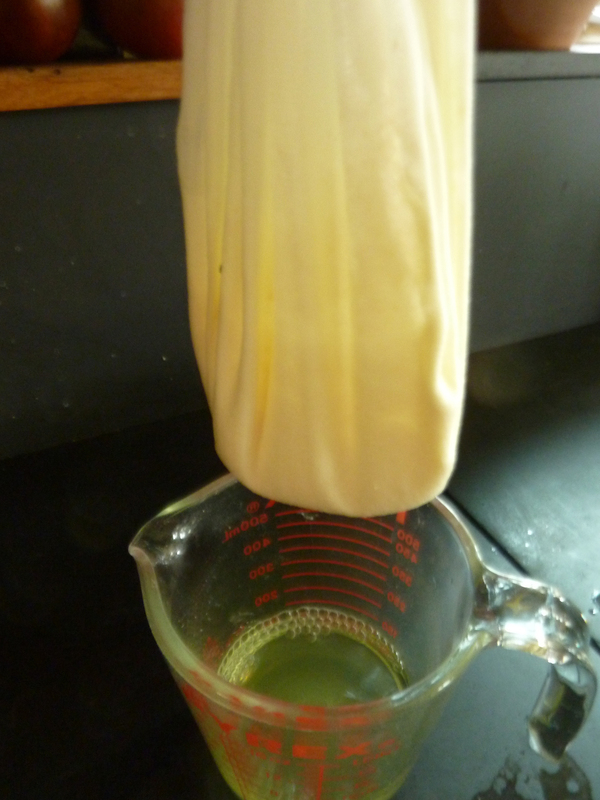 Tie up the cheesecloth ends and allow to drain for 15 minutes to a couple of hours depending on the firmness you seek. Salt to taste. Mangia! Ricotta ready for tonight's fresh ravioli! *You might well wish to consult an expert in cheese making for a more complete set of instructions. You guys make my mouth water. Have been passing your web site around all over the place. Thanks, Hetty. It sure is an incredible adventure filled with stories, good eating, and deep lessons about culture, tradition and simplicity. This era demands that we get creative and reflective, to lead in small ways–how we have lived in the U.S. is not sustainable, not healthy. I feel lucky indeed to put my experience to work this way! Come up to Vermont and explore with us!